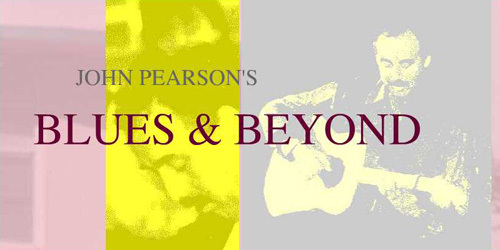 John Pearson continues in the tradition of the early country blues players who are his inspiration. He has worked with many of the leading British and American exponents of this music including Alexis Korner, Davey Graham, Jo Ann Kelly, Bert Jansch, Sonny Terry and Brownie McGhee, Louisiana Red, Rory Gallagher, Big Moose Walker, Woody Mann, Wizz Jones, Cephas and Wiggins, and Roy Rogers and his Delta Rhythm Kings. He has played the major blues, jazz & roots music festivals in Britain & Europe including Edinburgh Jazz & Blues festival, Edinburugh Folk festival, Jersey Jazz festival, Great British R & B festival & International Guitar Festival Of Great Britain aswell as many festivals in Ireland, Holland, Belgium, Germany & Denmark. He has played live sessions for national radio in all these countries & his T.V. appearances have included Jools Holland's show The Happening and the first Alexis Korner Tribute in 1994. His recordings include "Busy Bootin'" a collaboration with Roger Hubbard which was nominated Blues Album of the Year by British Blues Connection Readers' Poll - "The excellent guitar work from both players is a reflection of the extensive experience they have gained over the years". His solo album "Grasshoppers In My Pillow" received much critical acclaim - "If Taplas reviewers got to vote for their CD of the year this would be mine". His CD "Rhythm Oil" with his band Blues & Beyond has also received rave reveiws - "This excellent CD bursts with invention".The live recording "Just Blowed In Your Town" has also earned rich praise - "A wonderful live experience with JP leading a small band who really cook! One of those rare albums where everthing seems to work to perfection". Thirteen years of friendship and musical collaboration with Kenny Craddock ended sadly in May 2002 when Kenny was killed in a car crash in Portugal. For more info click here.